--There is an image I never, ever thought I would see again. I didn't think Tiger Woods had another major in him. I could see him winning tournaments when he came back, but I didn't think he would be able to best the best in the world at a major again. That being said, Tiger didn't do anything Tiger-like on Sunday at the Masters. As he said, he plodded around the golf course shooting a 70, but his experience at Augusta came shining through. He knew exactly where the ball had to be on the back nine when it mattered and he put it there. 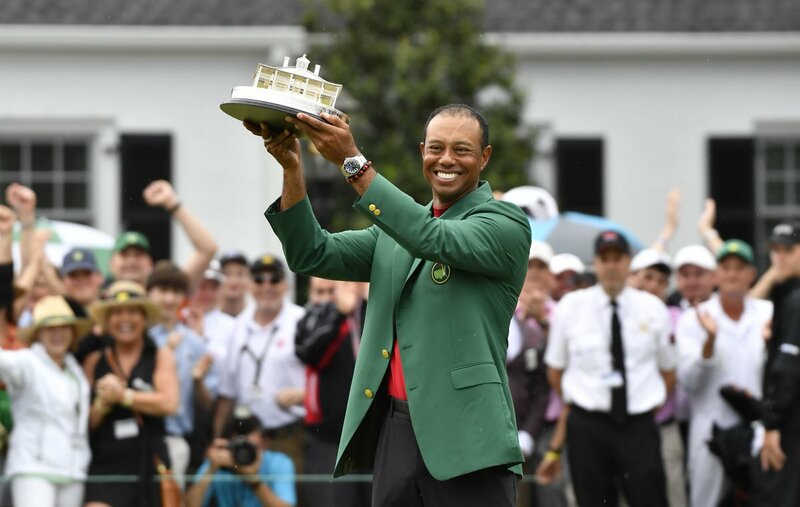 Guys like Francesco Molinari, Tony Finau, Dustin Johnson, Brooks Koepka etc etc didn't exactly give it to him, but they opened the door enough to let Tiger march through winning the green jacket in style. I'm still stunned to see how many just had a brain cramp on 12 which opened that door for Tiger. Molinari and Finau who were with Tiger in the last group saw their ball go in the water while Tiger just played it safe. Was that the intimidation factor coming through or was that the pressure of a major coming through on guys that hadn't won one? I say its the latter because Tiger wasn't tearing up the course as he has been known to do. That walk up 18 was different this year. It wasn't expected as it had been years ago. It was now a pleasant surprise. I don't know if it was unexpected because we had seen that he could compete at a high level again, but it was different. Seeing him celebrate with his kids was a cool moment. They got to see the Dad they had heard so much about do his thing on what is arguably the game's biggest stage. Its well known I am not the biggest Tiger fan, but give respect where respect is due. From going to a thought he would never play the game again to being on top of the golf world is a major (no pun intended) accomplishment. I still say Nicklaus was better, but like other sports, you can't compare the eras. Is he the greatest athlete ever? I wouldn't put him with Michael Jordan. and I certainly wouldn't put him with Muhammad Ali. What he has done for the sport of golf is great, but Wayne Gretzky and his trade to LA made a league what it is today. If it weren't for Wayne becoming a King, there are no Ducks, Sharks, Lightning etc. etc What would the NHL look like today if that trade didn't happen. --The record book will say the USA won the world women's hockey championship, but it was Finland that did so. How can you not call the game-winning goal a goal? That was a travesty of justice! It was not goalie interference, the American goalie was not in the crease and while she was bumped, the US player appeared to initiate the contact with the Finnish player resulting in that bump. While it sucked to see Finland beat Canada in the semi-final, it was great to see another country start to show signs of being competitive by beating Canada and preventing the all-too-familiar Canada-US gold medal game. It would have been great for the sport to see Finland beat both Canada and the U-S but now instead a black mark is placed upon the sport. By the way, how does the narrative change in this country if Finland bumps the Canadian goaltender to win the game and not the American one. Would we still be saying what we are. Some of us might, others wouldn't be. --There is a huge difference between Nazem Kadri and Brad Marchand. Marchand is a little prick, but he can play the game and get under people's skin the "right way". Kadri is just a complete idiot. The Leafs forward once again let his emotion get the best of him in Saturday's Game 2 loss and while you can debate whether or not Jake DeBrusk is guilty of a knee-on-knee hit (like many on Hockey Night on Canada, I don't think it was an intentional one), you can also say Kadri just took himself out of the series again like he did last year. He simply can't be depended upon by a team that is so close to being where it wants to be. Didn't Kadri say before the series he was smart enough to avoid any on-ice trouble? Yeah right! A leopard doesn't change his spots. Still with the Leafs, where has Auston Matthews been? If this continues for a second playoffs in a row, the cries will be loud in Leafsland where Mitch Marner is perhaps showing himself to be a bigger and better asset than number 34 which is saying a lot. --The New York Islanders are up 3-0 on the Pittsburgh Penguins and one of the big reasons for that is Jordan Eberle. I couldn't be happier for Ebs. We all know he was considered the scapegoat for the Oilers playoff failure a couple of years ago. He was basically given away as all Oilers fans know. Many would like to see him return in free agency, but I realistically can't see that day happening. Why would Eberle want to come back unless he has a deep love for Edmonton. This just in, I think those days are over. --Who takes the fall for what appears to be the first round playoff exit of the 62-win Tampa Bay Lightning. They were the highest scoring team in the NHL in the regular season and they have 5 goals in three games with three of those coming in Game 1. Who realistically saw this one coming. I'd have to go back, but could this be the biggest upset in Stanley Cup history? How many games did the Oilers win in the year when they were beaten by LA in the playoffs? Edmonton at least won a couple of games in that series or was it just one. --Are Jets fans breathing a little easier now? --The Toronto Raptors lost Game 1 of a playoff series and Kyle Lowry sucked. Where have we heard that before? Its time to see if Nick Nurse can do what Dwane Casey couldn't and find a way to get this team to where it should be. Good luck! --If you follow Genie Bouchard on Instagram or Twitter, I think you will agree that she is having a great time on her vacation in Florida. --Pete Rose is 78? I saw that nugget of info while watching the Cubs-Angels on Saturday 78? --I've never watched Game of Thrones. It doesn't interest me in the least. What a bunch of crap, it took 12 minutes to call back that Finnish goal. At least the Riders knew almost instantly that they had too many men on the field. I guess it's not the girls fault but the Americans in general should be ashamed of what they did. What's funny about Kadri is he has let a 21 year old occupy space in his head. He is so over-rated. The Leafs should just get rid of him in the off-season. I am sure there will be someone who would take that idiot. Kadri is never going to learn. Just suspend him for rest of the playoffs this season. Take a look at what Stamkos does in the playoffs. Tells you all you need to know about Tampa. As far as the Finland-US game goes, that might be one of the biggest jokes I have ever seen. In what world is that not a goal. That goal could have been historic for women's hockey globally. USA Hockey and the IIHF should be wiping egg off their face for a long time after this one. Couldn't agree more with you on Matthews. Add Gaudreau to that list too. Has Crosby done anything yet?